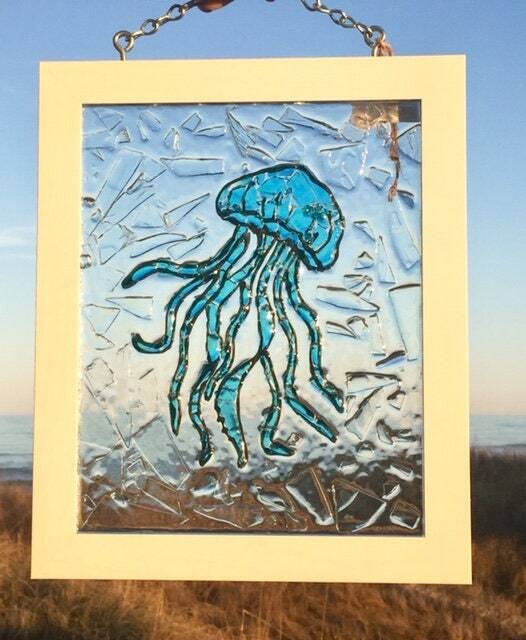 This ready to beach glass window will bring that beach feel to your home right away. 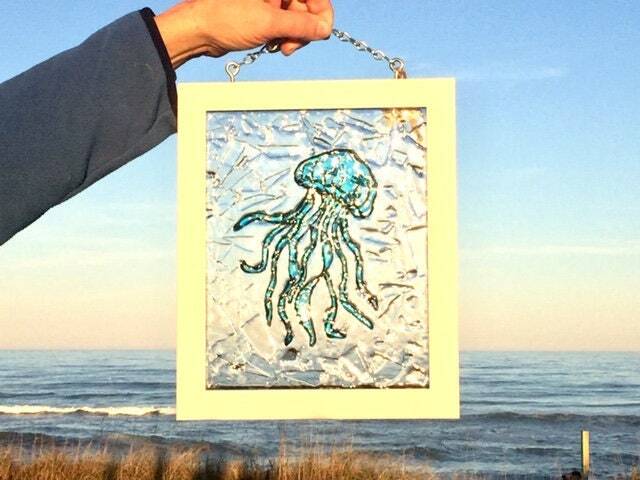 It measures (outside of frame) approximately 9 3/4" wide and 11 1/2" tall, (glass inside of frame is 8" wide and 10" tall,and has sturdy chain at the top for easy decorating straight out of the box. 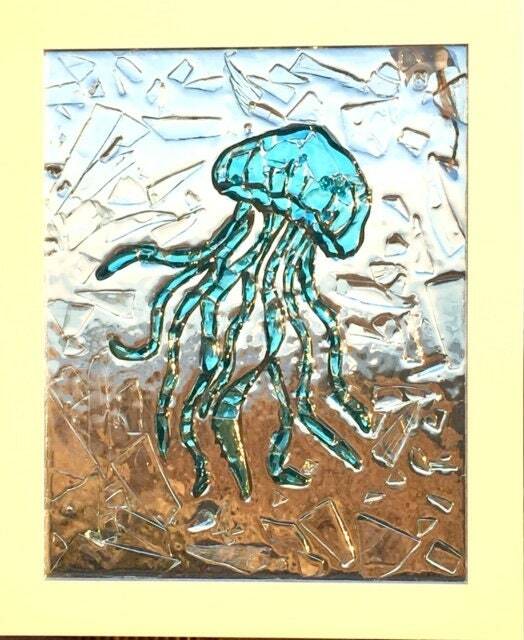 This beautiful piece has an octopus shaped from broken glass, which gives it texture, and then it's permanently sealed with resin. 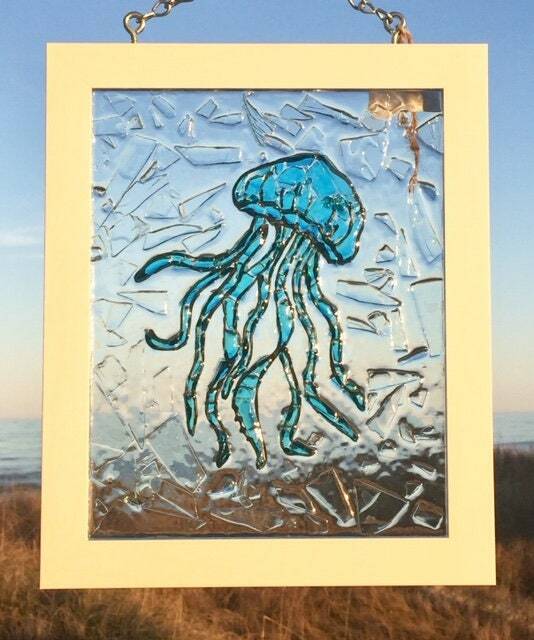 Our glass window art is handmade by 2 sisters, one of our local artist teams who also create art for our bricks and mortar store Beach House Dreams on facebook. Thanks for stopping by, and have a blessed day! Yes, almost all of our orders for painted towel racks, furniture and prints are custom orders. Most painted listings give you a drop down menu to select your colors and let you choose if your items are distressed or not. Due to the volume of orders we are processing, and since almost everything we make and sell is custom made, the usual turnaround time is 10 business days or 2 weeks before we ship your order. Occasionally the time could be less- contact us with questions about your particular order. I need my order sooner; can you help me? Depending on how many orders we are currently processing, there may be times when we can ship your order in less than 2 weeks. Contact us with your question, and we'll do what we can to help you. What info do you need from me to customize my order, and how do I provide this information to you? 1. put your choices in the message to seller section as you check out. 2. send a conversation message to us when you purchase. 1. put your choices in the message to seller as you check out. If you forget to give us your color or custom details, we cannot process your order until you send us that info. Please double check the personalization info and custom details you send us, as well as your shipping address on file for etsy- we ship to the address etsy provides us. If your item is defective, we will of course replace it for you. What if I forgot to send you all the info you need to start my order? We will contact you via an etsy conversation if we have a question about your personalization or if you forgot to include all the info we need. We strongly recommend that you have an email address you check regularly linked to your etsy account for this purpose. If you do not check etsy convos regularly, or have a current email address you check regularly linked to your account, once we have attempted to reach you, we can not proceed with starting to work on your order until you get back to us. Do you have a bricks and mortar store? Do you offer wholesale items to other stores and businesses? If you have a retail or furniture or home décor store we would love to talk with you about possibly carrying some of our signature unique products in your store. Contact us here, and we'll get back to you asap. If you are a designer, decorator, home stager or contractor and would like to feature some of our products, we would love to hear from you. We've worked with quite a few designers and some retail stores throughout the US, and we enjoy working with other companies. Contact us so we can talk about the possibilities. Gorgeous! Hand crafted with beautiful attention to detail. Darling! So pleased! Thanks so much!